Gift in a Jar ideas are always enhanced by the presentation of the jar itself. 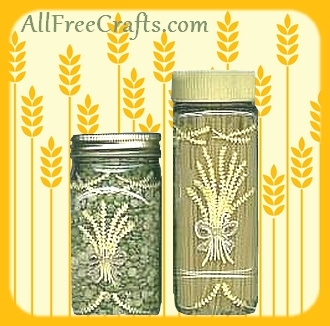 Simple embellishments, from fabric circles attached with a rubber band around the top, to this wheat sheaf painted motif, can be highly attractive, making your gift a two-for-one affair…once the contents are consumed, the jar becomes a second gift, useful as a canister or ornament. If you like to have flour, pasta, coffee, sugar or flour handy, then you might like these hand painted canisters made from coffee jars and mason jars. The wheat sheaf motif is easy to do with yellow paint marker. Nestle instant coffee jar, a mason jar, or other assorted jars that you like. Paint markers in yellow, white and bronze, or yellow and the colour you’d like for a bow. The stems are criss-crossed, freehand, across the top of the jar, and simply arched to meet across the bottom. Experiment with your own placement ideas on a piece of paper, then add to the jar as you like. For the bow, choose your colour and outline the bow shape with two stylish forked tails . Add highlights with white marker. You could paint the lids of the jars to match, as in the taller coffee jar here, or just leave them plain, like the mason jar lid. Yellow scraps of gingham or other pretty fabric could be cut in a circle and fastened on the lid with a rubber band, topped with a bow. Use the jars as canisters for coffee, sugar, flour, pasta or other kitchen staples that you prefer to have handy.